This post has been sponsored by Finlandia. All thoughts and opinions are my own. Must be 21 or older to consume alcohol. Please drink responsibly. Good company with good cocktails are a tough combination to beat in the summertime. It’s a relaxing, fun way to enjoy time with friends and since it only requires a few snacks and beverages, it’s also a pretty low-key gathering, too, aka the only kind of gathering you want to have in the summertime. While this cocktail itself is simple, there’s still plenty of fancy ways to serve it. But don’t be fooled by my use of the word fancy. Though these serving ideas might sound complex, they’re still just as simple as the drink recipe itself. 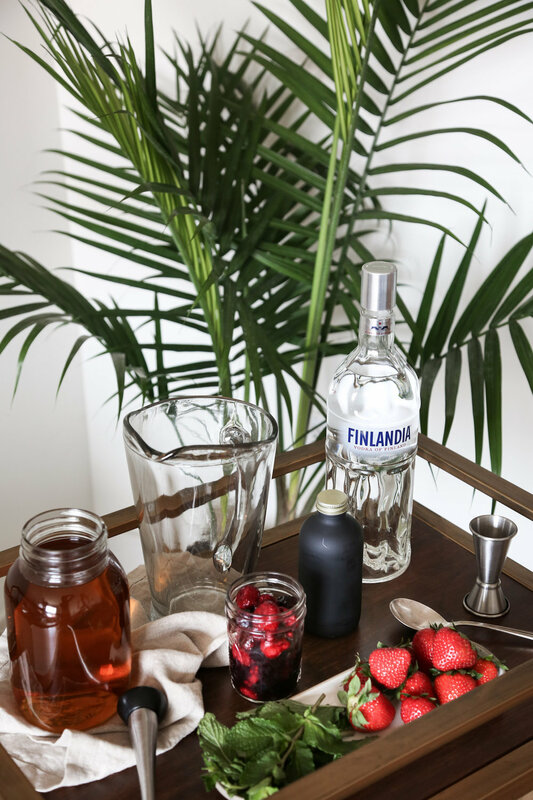 With one simple recipe and a variety of ways to serve it, you can really elevate your gathering and keep things fresh and exciting without the work of making multiple cocktails. Read on for the berry lavender spiked iced tea recipe and details on each serving idea, plus peep the video for a step-by-step on making the cocktail. Add berries to a pitcher and muddle into a thick pulp. Then add the vodka and simple syrup and stir to combine. Serve chilled, over ice. In a medium-sized saucepan, stir together the sugar and water and place on a burner set to medium heat. Add in the dried lavender and continue stirring for approximately 10 to 15 minutes, or until the sugar has completely dissolved into the water and the mixture appears translucent. Remove from the heat and allow to cool. Store in an air tight jar or container in the refrigerator for up to 6 weeks. Mini Watermelon // This is a quintessentially fun summer way to serve a drink and a great way to share a cocktail with friends. No glasses are needed, making clean-up super easy and the extra fruit doesn’t hurt, either, right?! I’d recommend serving this at a bbq or picnic, aka somewhere that it can be placed in the center of the table and easily shared. How to Do It: Slice the top off of the watermelon, then scoop out the inside, making sure to leave at least a few inches on the bottom (to prevent anything from leaking out). Side note: this can be done in advance, then covered in plastic wrap and stored in the refrigerator until ready to serve. To Serve: Fill with chilled spiked iced tea, add in a few lemon slices, garnish with lots of fresh mint and add in a straw for each person you’ll be sharing the drink with. Fruit & Citrus Skewers // Citrus twists make everything, even a glass of water, look high end, at least in my opinion, but they couldn’t be easier to make! Pair them with berries and you’ve got yourself one snazzy little drink skewer in no time. Pro tip: these can be made ahead of time (so feel free to make a big bowl of them), then when it comes time for serving, set the bowl out along with the pitcher of tea, glasses and a container of mint and let everyone garnish their own drink. How to Do It: Simply add a lemon twist and a strawberry half to a skewer. Fill a glass with ice, pour in the iced tea, add a generous sprig of fresh mint and garnish with the skewer. Mini Flower Bouquet Garnishes // These whimsical garnishes aren’t for everyone but they’re certainly one of my favorites and they’re especially perfect for a ladies luncheon or an afternoon picnic. With so many types of flowers to choose from, this is another garnish with an endless array of variations. It’s also another great DIY one, if you just so happen to want your guest to get involved. How to Do It: Cut the twine three times the width of the jar. Select your flowers (I recommend 3-4 types) and trim them down so that the stems are only about 3-4” long. Wrap your twine completely around the mouth of the jar once, and tightly tie your mini bouquet to the side of the jar. Trim the ends of the stem and twine, then fill with ice, spiked tea and add in a straw. Note: the glasses can be decorated ahead of time, just fill with the ice and drink right before serving. Homemade Popsicles // Adding a popsicle to a cocktail is nothing new, but it’s still one of my favorite ways to enjoy a drink in the summer. I mean, who doesn’t want something icy cool in the summer heat? Plus, with a variety of flavors, it allows everyone to customize their cocktail how they choose. I took inspiration from another favorite summer drink, the Arnold Palmer, and made peach lemonade and strawberry lemonade popsicles, but you can really use any juice you choose. You can even add in berries, mint or other flavors for truly unique options. And yes, you can 100% use store-bought popsicles, but when homemade ones are so easy to make (and taste so much better) why would you want to use anything else?! How to Do It: Fill your popsicle maker with juice, add in popsicle sticks and freeze at least 12 hours, or preferably overnight. To Serve: Fill a glass with iced tea, garnish with mint or lemon twists (if desired) and add a popsicle right before serving.